DURING THE LATE NIGHT HOURS OF SATURDAY, DECEMBER 26TH, 2009 UNKNOWN THIEVES ENTERED THE HOME AT 1800 HONDO IN COLLEGE STATION TO COMMIT A BURGLARY. EVIDENCE INDICATES THAT THE THIEVES ENTERED THE HOUSE BY PRYING OPEN A LOCKED SLIDING GLASS DOOR. ONCE INSIDE THE RESIDENCE, THE BURGLARS RUMMAGED THROUGH TH EHOME FOR ITEMS TO STEAL AND PICKED UP A SADDLE ALONG WITH SOME ELECTRONIC ITEMS. BEFORE LEAVING THE HOUSE THE THIEVES SET A FIRE ON A MATTRESS IN ONE OF THE BEDROOMS AND THEN FLED FROM THE SCENE. FIRE INVESTIGATORS STATED THAT THERE WERE INDICATIONS THAT THE THIEVES INTENDED FOR THE FIRE TO DESTROY THE HOUSE. ON FRIDAY, NOVEMBER 27TH, 2009 AROUND 10AM AN UNKNOWN WHITE FEMALE KNOCKED ON THE DOOR AT 1301 BARTHELOW IN COLLEGE STATION. WHEN THE RESIDENT OPENED THE DOOR, THE WHITE FEMALE IMMEDIATELY STARTED ASKING FOR MONEY. THE RESIDENT DID NOT SPEAK ENGLISH AND INDICATED TO THE FEMALE TO LEAVE AFTER TRYING TO COMMUNICATE THAT THERE WAS NO MONEY. A FEW MINUTES AFTER THE FEMALE LEAVES, THE DOOR TO THE APARTMENT IS KICKED IN BY A BLACK MALE WIELDING A KNIFE, THEN A SECOND BLACK MALE FOLLOWED THE FIRST INTO THE APARTMENT. WHILE ONE HELD THE RESIDENT AT BAY WITH THE KNIFE, THE OTHER SEARCHED THROUGH THE BEDROOMS LOOKING FOR MONEY. THE SUSPECTS DID NOT FIND WHAT THEY WERE LOOKING FOR, THOUGH THEY STOLE A CELL PHONE AS THEY FLED FROM THE APARTMENT. WITNESSES STATED THAT BOTH BLACK MALES GOT IN TO A LATE 90`S MODEL RED FOUR-DOOR DODGE PICKUP TRUCK THAT WAS BEING DRIVEN BY THE UNKNOWN WHITE FEMALE. THE FEMALE WAS DESCRIBED AS BEING SHORT WITH SHOULDER LENGTH BROWN HAIR. COLLEGE STATION POLICE DETECTIVES BELIEVE THAT THE WHITE FEMALE WAS ACTING AS A SCOUT LOOKING FOR POTENTIAL TARGETS AND THEN ACTED AS THE LOOK-OUT AND GET-AWAY DRIVER. It was on Tuesday, November 3rd, 2009 when a male victim was hit by a vehicle as he was crossing Texas Avenue at the intersection of East 17th Street. The Victim was crossing the street from the east to the west side at 9:30pm when a south bound vehicle struck him. The driver of the vehicle did not stop and continued driving south on Texas Avenue. A witness describes the hit and run vehicle as a dark colored pick-up truck. A security video at a store located a block south of the incident captured a brief glimpse of the suspect vehicle as it passed the store: a black or dark blue 4-door or extended cab pick-up truck. Bryan Police Detectives say that they expect that damages to the vehicle will be confined to the front. If anyone has any information regarding this hit and run homicide or know the identity of the driver involved, to call Crime Stoppers. On Tuesday, October 20, 2009 the building at 1721 Birmingham in College Station was burglarized. The building`s security video captured the suspect as he arrives at the building at 5:55am and pries open the door. After gaining access to the building, the suspect then proceeds to the second floor and pries open the doors to three offices. After stealing money from the building, the suspect then leaves the building at 6:07am. The suspect is a black male approximately 23 years old. 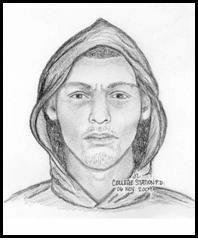 The suspect has medium complexioned skin and was wearing a dark colored hoodie and hat. The suspect also had a blue button up collared shirt that was unbuttoned. The shirt looked like it was a business shirt with a patch on one side and a name tag on the other side. The suspect was also wearing dark colored jeans. A dark colored SUV was seen in the parking lot prior to the burglary and College Station Investigators believe this vehicle may be connected to the suspect. On 10/25/09, at 7:17 PM, officers with the College Station Police Department responded to The Zone Apartments at 2001 Holleman Drive West, in College Station, in reference to a report of a robbery, in which a weapon was used. Officers investigating the robbery met with the victim, who is a local pizza delivery driver. The victim advised he had just delivered pizza in the complex and was walking to his vehicle in the parking lot when he was approached by a suspect pointing a handgun at him. The suspect demanded that the victim give him money or he would be shot or beaten. The victim gave the suspect his property and the suspect fled the scene running in towards the area of Holleman Drive West and FM 2818. The victim was not injured during the incident. On November 2, 2009 at approximately 8:00 PM, officers were called to 1331 Harvey Mitchell Parkway, Walden Pond Apartments, for a report of an aggravated robbery. The victim was not injured during the offense. Investigation revealed the victim parked a vehicle and was walking towards an apartment when approached by a black male suspect who pointed a silver pistol at the victim and demanded money. The suspect then fled the area westbound on foot. The case continues to be investigated by the College Station Police Department Criminal Investigation Division. Anyone who has information regarding this suspect or the investigation, please contact the College Station Police Department at 979-764-3600. SOMETIME AFTER 5PM ON SATURDAY, SEPTEMBER 20TH AND NOON THE FOLLOWING TUESDAY, THIEVES STOLE A TRAILER LOADED WITH SPEAKERS, LIGHTS AND OTHER MISCELLANEOUS AUDIO EQUIPMENT FROM RDM AUDIO LOCATED AT 3602 EAST 29TH STREET IN BRYAN. THE STOLEN TRAILER WAS A 20 FOOT WHITE 2008 PACE UTILITY TRAILER WITH TXLP 90ZVDC. THE TRAILER WAS UNMARKED ON THE SIDES AND DOES NOT HAVE FENDERS. THERE ARE DOORS ON THE REAR OF THE TRAILER AND A DOOR ON THE RIGHT SIDE WITH A PLYWOOD DIVIDING WALL BUILT BEHIND THAT DOOR. INSIDE THE TRAILER FOUR LIGHTS WERE MOUNTED ON THE CEILING. AMONG OTHER ITEMS, THE TRAILER CONTAINED 16 LARGE CUSTOMIZED SPEAKER BOXES WITH 18" JBL SPEAKER, 8 LOW BOXES WITH 12" SPEAKERS AND 8 MONITOR SPEAKERS. BRYAN POLICE DETECTIVES BELIEVE SOMEONE MAY HAVE BEEN IN THE AREA DURING THE TIME OF THE THEFT AND MAY HAVE INFORMATION THAT COULD LEAD TO THE IDENTITY OF THE SUSPECT OR SUSPECTS INVOLVED OR THE RECOVERY OF THE STOLEN PROPERTY. IDENTITY OF SUSPECT SOLVED BY CALL TO CRIME STOPPERS. WARRANTS HAVE BEEN ISSUED. ON SATURDAY, APRIL 18TH, A VISITOR FROM SAN ANTONIO REPORTED TO THE COLLEGE STATION POLICE THAT THEIR WALLET WITH CREDIT CARDS HAD BEEN STOLEN FROM THEIR VEHICLE AS IT WAS PARKED IN THE AREA OF TRADITIONS. THEY DISCOVERED THAT THE NEXT DAY THE THIEF USED THEIR CREDIT CARD AT NUMEROUS STORES IN COLLEGE STATION AND BRYAN. COLLEGE STATION POLICE DETECTIVES CHECKED THE SURVEILLANCE VIDEO AT THE TARGET AND LOWES STORES IN BRYAN AND WALGREENS AND KROGERS IN COLLEGE STATION AND FOUND THAT THE SAME WHIE MALE HAD USED THE STOLEN CARD AT EACH STORE. THE SURVEILLANCE VIDEOS SHOW A WHITE MALE, 20 TO 30 YEARS OF AGE WITH A DISTINCTIVE HAIRCUT, SHORT ON THE SIDES AND LONG ON THE TOP AND BACK AND NUMEROUS TATTOOS ON HIS ARMS. ONE OF THE VIDEOS SHOWS HIM DRIVING AWAY FROM THE STORE IN AN OLDER SILVER DODGE STYLE VEHICLE. HE PURCHASED OVER $2000 WORTH OF MERCHANDISE WITH THE STOLEN CREDIT CARD. IT WAS JUST BEFORE MIDNIGHT ON WEDNESDAY DECEMBER 31ST WHEN TWO MASKED SUSPECTS ENTERED A CONVENIENCE STORE IN THE 2600 BLOCK OF FINFEATHER ROAD IN BRYAN WITH THE INTENTION OF ROBBING THE STORE. SURVEILLANCE VIDEO SHOWS BOTH MASKED SUSPECTS ENTER THE STORE. WHILE ONE OF THE SUSPECTS, WHO WAS ARMED WITH A PISTOL, RUNS TO THE BACK OF THE STORE TO CONFRONT THE CLERK, THE SECOND SUSPECT RUNS TOWARDS THE COUNTER. THE SECOND SUSPECT IS SEEN KNEELING DOWN BEHIND THE COUNTER, THEN HE GETS UP AND RUNS TO JOIN THE OTHER ROBBER AND THEY BOTH LEAVE THE STORE THROUGH THE FRONT DOOR. THE FIRST SUSPECT IS DESCRIBED AS TALL AND SKINNY AND WAS WEARING A DARK BLUE HOODED SWEATSHIRT, MAROON UNDERSHIRT, BLACK PANTS, BROWN SHOES, GLOVES AND A SKI MASK. THE SECOND SUSPECT IS SHORTER AND HEAVIER THAN THE FIRST AND WAS WEARING A BLACK JACKET WITH A GRAY STRIPE DOWN THE SLEEVES AND UPPER PORTION OF THE JACKET, GRAY PANTS, WHITE SHOES, GLOVES AND A SKI MASK. BRYAN POLICE DETECTIVES ADVISE THAT THE VIDEO SHOWS THAT A FEMALE CUSTOMER LEFT THE STORE SECONDS BEFORE THE SUSPECTS ENTERED. DETECTIVES BELIEVE THAT THE CUSTOMER MAY HAVE SOME INFORMATION THAT COULD BE HELPFUL TO THE INVESTIGATION AND ASK FOR HELP TO IDENTIFY THE CUSTOMER. ON MONDAY MARCH 16TH A THEIF IS CAUGHT ON TAPE AS HE ROBS THE CONVENIENCE STORE IN THE 1800 BLOCK OF HARVEY MITCHELL PARKWAY IN COLLEGE STATION. SURVEILLANCE VIDEO SHOWS THE MALE SUSPECT AS HE ENTERS THE STORE AND WALKS TOWARDS THE COUNTER. THE SUSPECT IS THEN SEEN CONFRONTING A STORE EMPLOYEE. BOTH THE SUSPECT AND THE STORE EMPLOYEE ARE SEEN GOING BEHIND THE COUNTER WHERE THE SUSPECT RETRIEVES THE MONEY. BOTH THE SUSPECT AND THE STORE EMPLOYEE WALK TO THE FRONT OF THE STORE. THE STORE EMPLOYEE IS THEN TOLD TO LAY DOWN ON THE FLOOR WHILE THE SUSPECT EXITS THE BUILDING. THE MALE SUSPECT WAS WEARING A GRAY HOODED SWEATSHIRT AND BLUE JEANS. HE HAD A PALE WHITE `MICHAEL MEYERS` MASK COVERING HIS FACE. THE MASK HAD RED COLORED HAIR ATTACHED TO IT AND THE SUSPECT HAD HIS HOOD PULLED UP TO THE BACK OF HIS HEAD PARTIALLY COVERING THE RED HAIR ON THE MASK. 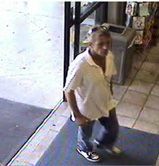 THE SUSPECT HAS BEEN DESCRIBED AS A WHITE MALE APPROXIMATELY 5`07" TALL, WEIGHING ABOUT 190 LBS. AND HAD A YOUNG HIGH PITCHED VOICE. On Monday January 12th a thief is caught on tape as he robs the convenience store in the 3300 block of Woodville Road in Bryan. Surveillance video shows the male suspect as he walks up to the store. You can see the suspect as he pulls a silver handgun from the back of his waist and points it at the store`s employees. The suspect is seen running behind the counter where he demands that the clerk open the register. The clerk then hands cash to the suspect from one of the cash drawers and the thief grabs the other cash drawer then leaves the building. 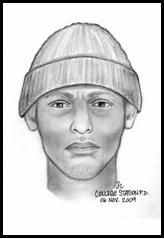 The suspect was wearing a blue hoodie jacket, with a distintive logo `ENYCE Clothing Company` on the chest, black pants, black hat, gloves and a red bandana covering his lower face. Bryan Detectives advised a trail of coins were found leading away from the store towards the Earl Rudder Parkway feeder road, though it is not known if a `get away` vehicle was used in the robbery. If anyone has any information regarding the identity of the robber shown in this video you are asked to call and report the information. It was between the times of 3:45am and 4:20am on Tuesday, November 11th when a convenience store in the 3300 block of Finfeather Street in Bryan was burglarized. Surveillance video shows a newer model dark blue Chrysler Town and Country Mini-van pulling into the store`s parking lot and three male suspects get out of the vehicle and approach the front of the building. The suspects use crowbars to force open the doors. After the suspects break into the store, two immediately walk over to the location of the safe. They are seen tossing money bags onto the counter and then pull out the safe and set it onto the counter. They slide the safe off the counter onto the floor where it is pushed ot the door. The mimi-van is then seen approaching the store and two of the suspects carry the safe to the back of the van while the third suspect holds the door. Two of the suspects had their faces and hands covered while the third suspect failed to cover his face and was seen talking on a phone. The suspect shown talking on the phone is a light skinned Black male standing approximately 5`08" - 5`11" tall and weighing around 200 - 220 pounds. Call Brazos County Crime Stoppers if you have any information regarding the identity of the suspects, the vehicle involved or the location of the stolen safe and/or its contents. It was sometime during the day on Tuesday, December 2nd when a rural Brazos County home was burglarized. Burglars smashed out the window in the back door, reached through to unlock the door then entered into the home. After ransacking and searching through the house, the thieves gathered various electronic items and guns, then left the residence through the sliding glass door. Brazos County Investigators report that six homes in the East portion of rural Brazos County were burglarized within the last week of November and the first week of December. The burglaries were all similar leading investigators to believe that the same burglars were involved in these crimes. If anyone has any information regarding the identity of the burglars or location of stolen items you are asked to cal Brazos County Crime Stoppers at 775-TIPS. On Saturday, June 7th a security surveillance camera in a building located at 1716 Briarcrest Drive in Bryan captured a male subject exiting the building through the stairway while carrying a computer monitor and plasma television. The cord from the television gets caught on the stairway and is ripped off the television. A short time later, the male subject is seen entering the building again where he retrieves the television cord from the stairway and then exits the building through the stairway. On Tuesday, September 23rd a security surveilaance camera at the same location captured another male subject enter the building and exit through a stairway door while carrying property that had been reported stolen. In both surveillance videos, the male subject is observed to be a heavy set White or Hispanic male with dark curly hair. Bryan Detectives believe the male subjects in both burglaries are the same person. It was on Wednesday, April 9th at 11:00am when 20-year-old Jenna Verhaalen was found dead on the floor of her apartment on the first floor of the Autumn Woods Apartment on Hollow Hill Drive in Bryan. Bryan Police Detectives tracked Jenna`s last contacts and found that she was a first year Blinn College student and had worked at Wings & More the night before. She had left work for home and was last seen by other residents at the apartment building at 12:30am. Crime scene investigators found no signs of forced entry into the apartment or evidence of a significant struggle. An autopsy revealed that the cause of death was strangulation. Bryan Police Detectives are actively investigating this homicide and would like for anyone who has information about Jenna or who knows something about this crime to call. Store surveillance videos from several College Station businesses have recorded a White male suspect using credit cards that were reported stolen. The cards were believed to have been stolen on Sunday, July 13th and the suspect immediately began to use the stolen cards in College Station and Bryan. The suspect fraudulently obtained a large amount of expensive merchandise with the cards. As seen in the videos, the suspect is a White male, in his late 20`s to early 30`s, approximately five-feet ten-inches tall, weighing 160 to 185 pounds and having blond or light brown hair. The suspect has a tattoo on the inside of his upper left forearm and wears a gold ring on his right middle finger. 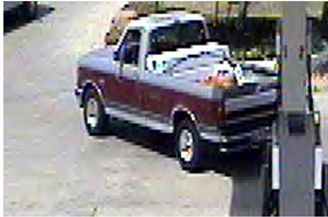 The suspect`s vehicle is an older model single cab two-tone Ford pickup, silver over maroon, with a white tool box. The Checker`s store located at 604 Holleman in College Station was robbed on June 13th and again on July 5th. On Friday June 13, 2008 at 11:28PM, a lone suspect entered the Checker`s store in a crouched position, approached the counter with his gun drawn and raised above the counter, and demanded money. After receiving the money from the clerk, the suspect left the store in an unknown direction. The lone suspect was described as a Black male, 25-30 years of age, 5`08"-5`10" tall, weighing 145-170 pounds (thin build), dark complextion, short hair and large round eyes. The suspect displayed a large silver semi-automatic handgun. On Saturday July 5, 2008 at 6:45AM two suspects entered the Checker`s store. The first suspect jumped over the counter and held the clerk at gunpoint. Both suspects then gathered money from the store and left the store in an unknown direction. The first suspect was described as a Black male, 25-32 years of age, 6`00"-6`02" tall, weighing 200 pounds (muscular build) and displayed a large dull silver automatic handgun. The second suspect was described as a Black male, muscualr build (approximately same build and sized as the first suspect). On Tuesday, June 17th the front desk clerk at the Ramada Hotel located at 1502 Texas Avenue in College Station was robbed at gunpoint. The security video shows two robbers enter the hotel. The first to enter appears to be a black male carrying a small dark colored revolver. He can be seen jumping over the counter and approach the desk clerk. The robber took the clerk to the office, made her lie down on the floor and covered her with a bed sheet that he had brought with him. The suspect then went straight for the cash drawer and is seen a short time later leaving the desk area, exiting through the doors on the north side of the building carrying the cash drawer and the desk clerk`s purse. He was dressed in a red/black striped long sleeve shirt, denim pants and dark colored gloves. A second robber, described as a male, was wearing a dark colored short sleeve t-shirt with a light colored long sleeve shirt underneath it and no gloves. He is seen entering the hotel from the southeast shortly after the first robber and attempts to make entry into the office. College Station Detectives state that the bed sheet that was left behind by the suspects was not from the hotel and had a print design on it. They also believe that the suspects had personal knowledge of the lay-out and money handling practices of the hotel. If anyone has any information regarding the identity of these two robbers you are asked to call Brazos County Crime Stoppers at 775-8477. You do not give your name when you call and you will be given a special coded number. The information you give will be shared with the appropriate law enforcement agency and if your information leads to an arrest or recovery in this case, you will be eligible for a cash reward of up to $1,000. HELP FIGHT CRIME IN YOUR COMMUNITY BY CALLING BRAZOS COUNTY CRIME STOPPERS TODAY.